The following is a collection of favorite memories Sean wrote about his life before it was taken from him unjustly. My dog, Lindsy, was afraid of swimming and would never get all the way in the water. But there actually was a time she would swim. Lindsy always had to be with me. And this was even true when I went out fishing in the little fishing boat. The boat would get pulled up on the shoreline, just a little to keep it from floating away. And even if we were just walking past it, Lindsy would jump inside to see if we were going for a boat ride. She only got out if I kept walking past. So nearly every time I went out in the fishing boat Lindsy was there. 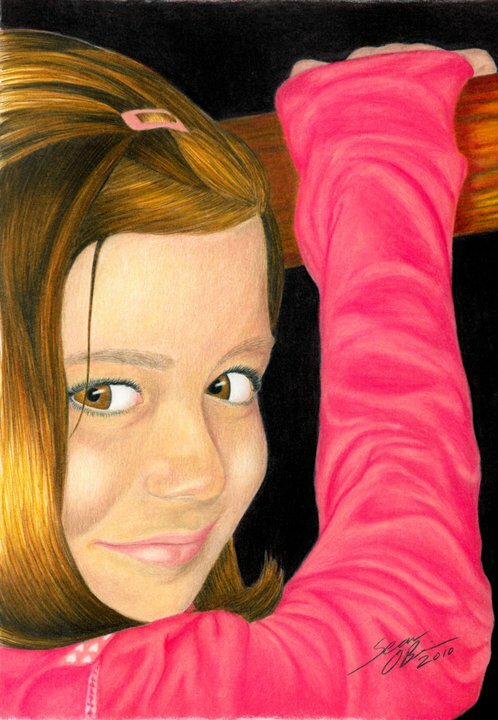 She loved to go for rides in the fishing boat, she would stand at the front leaning forward with her face in the wind. She was on top of the doggy world. As we would come back in towards shore, about 10 to 15 feet from land, Lindsy would get so anxious she would leap from the boat and swim right to shore. She would get out of the water, turn around, and look at me. “Look what I did!” I would pull the boat up and if I didn’t get right out she would jump back in ready to go. It’s like she couldn’t wait to get back to land so she could swim to shore but if I wasn’t coming to land she had to be with me in the boat. Now if I was fishing close to shore and the boat was sideways she wouldn’t jump out. Only if we were heading to shore and she knew the boat ride was over she would get out and swim. She was a silly dog. She had such a great personality. In many ways she thought she was a person. Lindsy was never trained as a real hunting dog. And the one time my dad tried to take her, she refused to come out from under the truck. Lindsy loved me and I wasn’t there so she was scared. Later after my parents separated Lindsy and I would pretend to hunt. Lindsy would get so excited anytime I would pick up my BB gun. At my mom’s Placerville house she would go racing down the hill looking for squirrels. She had real hunting instincts and she just knew what to do. I never actually shot any of the squirrels with the BB gun. I would just shoot at the tree and make Lindsy think we were really doing something. And we were. I loved seeing her excitement as she raced around from tree to tree for me, chasing the squirrels. She was such a fun dog. I never got to take her real hunting which I am sad about. But I love and cherish my memories of pretend hunting with Lindsy. 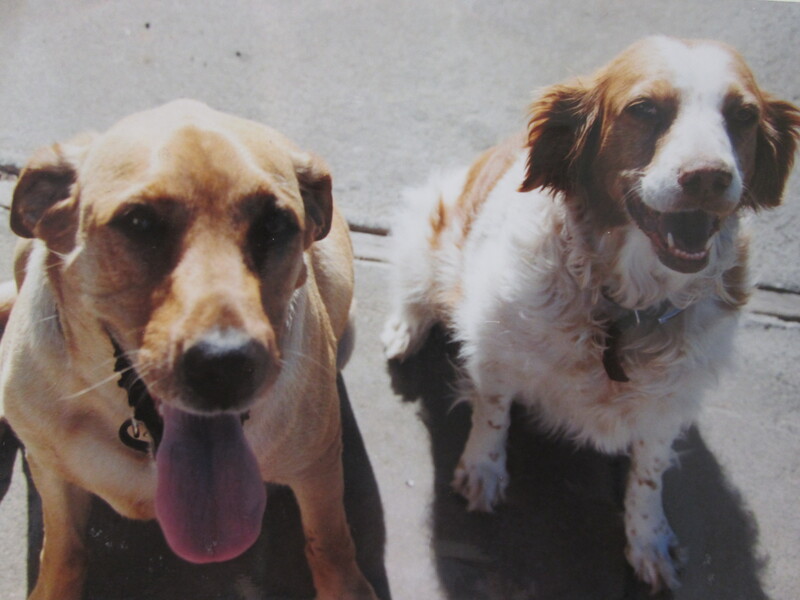 I loved my dogs and miss them every day. We went to Dillon Beach for Thanksgiving almost every year. I was always so happy to be going to the ocean with a group of people that often included Grandma, my mom, Kathy and her family, and family friends. The group varied each year, some people would be camped out at the sea wall right on the ocean while others rented houses up on the bluff. Between everyone there, there was always so much food cooked. Often multiple turkeys and I would always catch a bunch of crabs to cook for everyone. Mmmmm! In this particular memory I was about 13 or 14 years old and we had our aluminum fishing boat so that we could catch crabs on the bay. I was the only one there who actually knew how to catch them even though I was the youngest by at least 10 years, I was the leader. I was in charge of our adventure teaching my cousin Danny and Lea’s ex-husband how to catch the crabs. They really listened to me and did what I told them because they knew I knew what I was talking about. When I was really little, about 5 years old, I watched and remembered everything my Grandpa Deacon did to catch the crabs. And I never forgot it. There we were out on the bay catching so many crabs years after my Grandpa had passed away. I was still using what he had taught me. Mostly we’d catch red rock crabs that have black tips on their claws. And a good size one is about as wide as a piece of paper. They have to be at least a little over seven inches to be legal to keep. By the time we were done we had caught a whole mess of crabs, all of them were red rock crabs except for one Dungeness crab They are the same size, but more of a grey blue with longer skinnier claws. They are considered like a “high end” crab. So my cousin Danny laid claim to the Dungeness crab and went on and on all day about how he was going to get to eat it. Later when all the crabs were cooked and ready to eat there was a whole pile of them. Danny raced over to get his special crab first before anyone else, even saying that he was going to get the Dungeness as he grabbed one. After all that he actually got a rock crab. I don’t remember who actually got the special crab but it wasn’t Danny! That was the last time everyone was together on Thanksgiving. We did have a lot of crabs that year. I would really love to go back and spend Thanksgiving at Dillon Beach again just like we used to. My dad got out of the boat armed with the boat oar. We made our way back up the dam to where I saw the snake and he was still right where I saw him. He hadn’t even moved, because while it was warm enough for a little lizard to be out sunning itself, it was too cold for mean Mr. Snakey. My dad moved the rattle snake with the boat oar and the giant viscous monster that had chased me down the entire dam was maybe 20 inches long and so cold it could barely slither away. My dad said we couldn’t leave it to bite anyone so he didn’t let it get away. The next boy may not be smart enough to run like hell from this snake. As soon as I saw it I knew what it was and it scared me so bad. I love lizards and reptiles but I want nothing to do with the Mr. Mean ones. No thank you. I used to really love doing 4-H because I enjoyed the animals so much. Just being around the farm animals felt so natural to me. Whether I was raising a pig or a steer I just always loved the animals themselves more than any of the rest of it; getting in their pens with them, working with them, learning their personalities.The steers were always so cool; so big yet gentle. And the pigs were always so curious, they came up to me, rubbing their noses on my leg, smelling and sniffing me.Sometimes the pigs would get all excited and end up running all crazy fast as they snorted. I really miss the animals. It was a great experience I just with it could have been more challenging. Some of the other clubs would allow the kids to do breeding projects and to raise the baby animal. I really enjoyed my last steer, Chester. He was a red limousine breed of steer, like a golden red rust color. One day I was going down to check on Chester and he was gone! The gate was still closed but he was not there. Vanished. Nowhere to be seem. I was worried. I quickly grabbed his halter and lead rope. I had to find him. I remember looking back up the hill toward the house, I saw nothing. The property was fenced in on three sides around the house, if he was up there he’d be safe. So I went down the hill towards the road and danger for Mr. Chester steer. I looked through the brush to make sure he wasn’t there. He wasn’t on our property. My worry was growing. What if he had gotten out to the main road? What if a car got him? I walked down to the little road we lived on that led out to Motherlode Rd. I looked up the street and there he was! My steer was standing at the top of the hill, sideways in the road, looking back at me. Lindsy was by my side, I told her to sit and stay, I didn’t want her to spook Chester. Slowly and calmly I walked up the hill to him. He never moved, just kept watching me with his big round eyes. I get up the hill to him and there were two cars in the road wanting to drive past but he is in their way. Those cars probably stopped him from going out to Motherlode. I reached my hand out to him and he let me rub him. He just stood there as I gently put on his halter, and secured it. I had my steer back!I was so relieved. I led him by his rope to the first driveway to allow the cars to pass by. They I took him back home and put him in his pen and still didn’t know how he got out but I was just so relieved to have him back where he belonged. 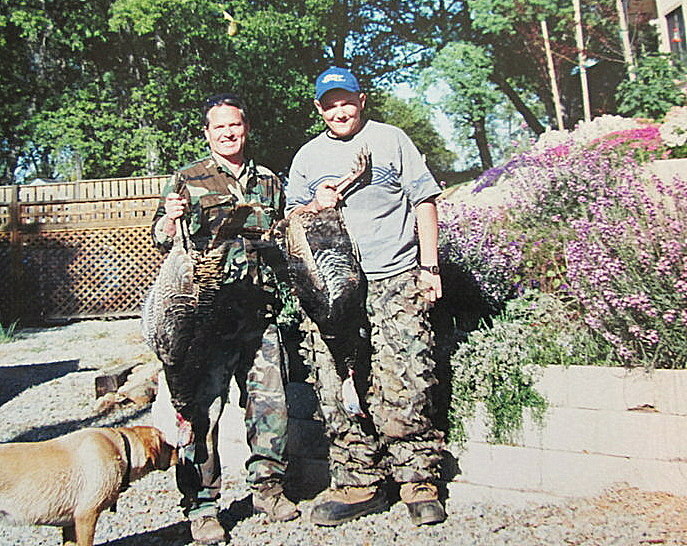 The first time my step-grandpa Pat and I went turkey hunting together we went down Ponderosa Road to my Uncle Bill’s property. 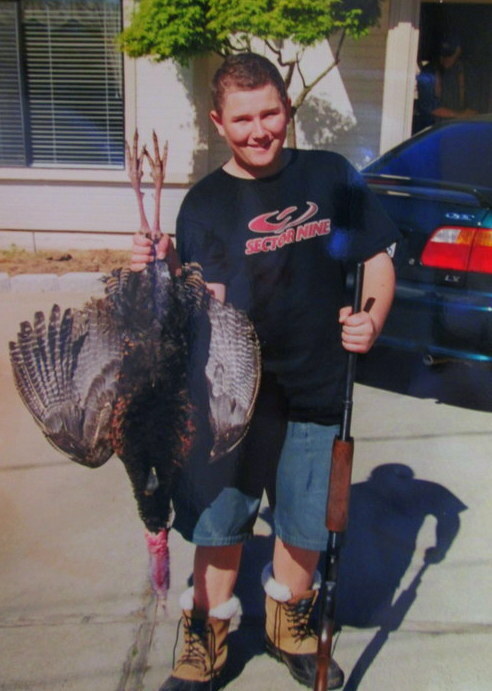 It was the first time I ever called in and got my own turkey. I felt so proud of myself and the turkey was so big! When we finally got back to my mom’s house with it, she went to the store while Pat and I cleaned it up. When my mom got back from the store she had bought this rotisserie roaster deal that fits inside a Weber BBQ. We were going to BBQ my first turkey. It was a celebration for my first turkey! So my mom prepared the turkey while I figured out the rotisserie and after some trial and error it was all ready to go. And we ended up BBQing my first turkey on a rotisserie roaster in our BBQ. That turkey was the most deliciously yummy turkey I’ve ever eaten. It was so good. I used to have a job splitting wood, I worked for these two guys Pat and Wayne at P&W Fire Wood who were friends of my dad. They had this empty lot with all this unsplit wood on it; rounds and rounds that needed to be split. All of the time they would bring more by the truck load and they needed someone to split it all. They had a gas powered hydraulic wood splitter, made from hydraulics from a bulldozer. It would split anything! So for a while after school during my freshman year I would go over there and split wood. I am not really sure how long I did this for but it was a couple months and during that time I split so much wood. The unsplit rounds would be stacked up and I would split it all. I would make the biggest pile of firewood, then I would stack it all nice and neatly. They also had this big dump truck that held one cord of wood. Anytime it was empty I had to fill it up. I would throw a bunch of wood up into it, then crawl up in there and stack it all up. The I’d get out and throw more into the truck until it was filled. I got real good at stacking wood quickly and sometimes Pat would take me to deliver the wood to a customer’s house and he would tell them that I would stack it for a $20 tip. He knew which ones would do it and that’s when he usually took me. I actually enjoyed the job a lot. I liked wearing the leather gloves, moving the wood around, hearing the wood ‘pop’ as it split apart. When we were living in the rented house in Shingle Springs I was riding my go-cart along the dirt road that led to the creek pool. There was a spot where some deer brush and manzanita grew in on the roadway, making it more narrow and closed in but still one car-width wide. At this point on the road it sloped down towards the creek pool, it got more rocky and bumpy too, which was fun to drive on in the go-cart. Suddenly out of nowhere zipped this little tiny horned-toad about the size of a Susan B. Anthony coin with little arms and legs and a little trail. I saw it quickly and knew instantly what is was. But then I was already past it, everything was so quick, I hope I didn’t run him over! Oh no. I hit the breaks as fast as I could. I wanted to make sure it the horned-toad was alright. Then I want to catch it. When I raced back to the horned-toad it was not moving. I picked it up. Hi little honed-toad. I didn’t know if the tire went over him, maybe he was between the big rubber knobs on the back tired, maybe the tire was up on a rock? But he seemed fine, no visible injury. He opened his little eyes, I softly closed my fingers around it. I felt him shift in my hand, I hoped he was OK. I hopped back in my go-cart and quickly turned around to drive right back to the house, I wanted to put him in something where he couldn’t get away so I could check on him. When I got home I gently put the horned-toad in an empty glass fish tank. I had several of those always ready for my next prize. The horned-toad didn’t move at first…then he zipped about. Here, there, back the other way. He was so fast for such a little guy. I kept him for just a couple weeks, maybe not even that. I knew he had to eat ants so I caught him a bunch but ants aren’t easy to catch. So that’s why I did not keep him very long. He was such a cool little guy and I was glad he wasn’t injured. When I let him go, I took him back to the spot I had found him and turned him lose. Bye bye little guy. He zipped away into the brush. Scurry scurry. There was this pond on Prarie City Road that was just kind of there. I’m not really sure why it was there, but it had open access and my Uncle Doug used to fish on it all the time. Eventually he began taking me with him. I was probably 11 or 12 years old. So one day we were down at the pond fishing. My Uncle Doug had gone off somewhere else to fish. I had caught small bluegill to use as bait for a bigger bass. I went out to this dock thing that was about 15 feet above the water. It was only wide enough for one person and went out about forty feet into the pond. I looked down into the water below, the water was really clear and I could see all kinds of fish swimming. I was about to cast into the water when I saw it…there was this big pond turtle lazily swimming along. His little legs were reaching out and pulling himself through the water about three or four feet below the surface. Instantly I wanted to catch him! So I cast towards him, as soon as my bait was in the water it was obvious to the turtle that it was an injured fish and Mr. Turtle went right for it. I could hardly believe it. “Am I really going to catch a turtle? I’ve never caught a turtle before!” I thought. I was so excited. I felt such a rush as I watched Mr. Turtle swim right towards my bait and bite onto it. He just bit onto the fish and held on. I began to reel and peel him in towards the dock. My fishing pole was bent deeply, it was a heavy turtly. (no that’s not a typo, that is really how Sean talks) I worried I wouldn’t be able to lift him 15 feet up to the dock. So I pulled him through the water to the bank; which I had to climb down because it was steep. I got to the water’s edge and there was my Mr. Turtle still holding onto my bait fish. He didn’t let go until after I reached down and picked him up. Then he let go of the bait, the hook never touched him. Mr. Turtle was just holding on so tight he would not let go- thankfully it was never my finger! I had caught me a turtle! I felt proud of my accomplishment. I then put him in a bucket and took him home where he was my pet for a number of years. When I was little I used to love catching frogs. I would search for frogs all the time. Whenever we went camping I would search for bullfrogs. Going to the back of Sly Park Lake was my favorite. The back place is called Chimney and it gets more swampy with lots of shallow water and grass reeds. I would catch so many small bull frogs. And the giant bull frog pollywogs. I loved pollywogs. They are such a weird creature; then they turn into frogs. One time at Sly Park I caught a giant bull frog. He was massive. I caught him right before we were leaving to go home. I remember getting to put him in this blue metal cooking pot. I had to hold the lid down the whole way home and set him free in our pond. 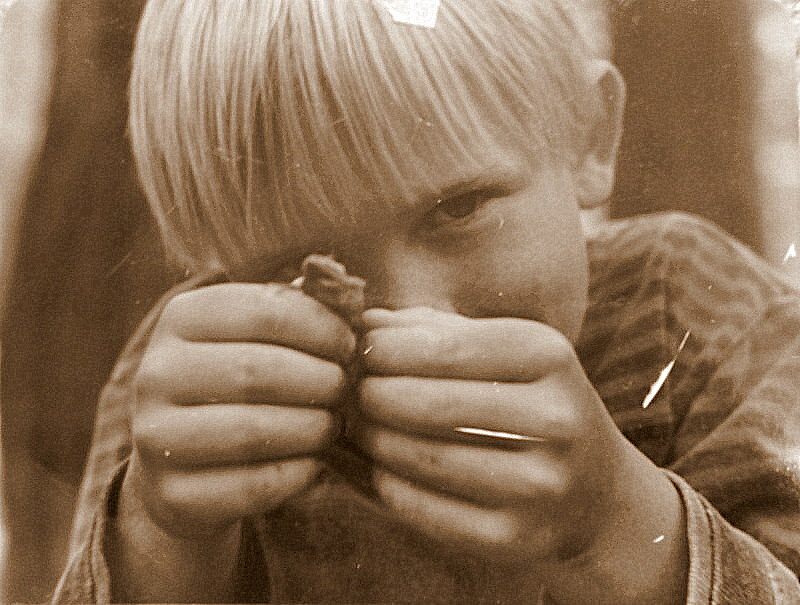 At my dad’s I would always go outside in the dark with a flash light to hunt for frogs; mostly all the tree frogs; occasionally a toad would come out at night and they’d croak. Croak…croak…croak!! I liked watching their little throat sack fill with so much air like a little balloon. It was so cool. When you shine a light on a frog in the dark it blinds them momentarily and makes them really easy to catch. I would catch them and keep my favorites in an empty fish tank. I liked watching them be frogs, and I always set them free after a few days. When I was in high school I often went to a youth group. During my freshman year in high school my youth group did this things called Sierra Service Project. It was a real big deal, they rented two big passenger vans and we all traveled to Arizona to do volunteer work. We went to the Hopi Indian Reservation to help them work on their homes. They were a real low income community and our job was to help improve their roofs on their homes so they wouldn’t leak in the winter. The Hopi people were really nice and they often cooked us special native foods. Where they lived was really cool too. Their homes were all up at the top of this great big plateau that overlooked everything all around. At the base of the plateau they had gardens. We were there on the 4thof July and we got to watch the fireworks from the top of the plateau/ The fireworks were launched from the local school down below but we were so high that we were almost looking straight out at the fireworks. On one of the last days we were there the Hopi people had one of their traditional celebrations where they got all dressed up in their traditional attire. It was awesome to see them dance and perform. The whole experience was a lot of fun. When I was little and my parents were still together I had this best friend, Scotty Woodward. I only saw him every other weekend because his parents were divorced and he spent most of his time with his mom in Colfax. But the weekends he went to his dad’s we always did something, our parents were also close friends. So every year our families would go up Iron Mountain Road past Sly Park to go sledding. We would drive up until we found snow, then we would keep going past the first groups of people until we found a good spot for ourselves. We would have so much sledding. Of course us kids went right to it. Zipping down the hills, making our paths, taking snow to form jumps that we could get air off of. Nothing crazy, just enough to go weeee! Our parents would dig out a hole in the snow to build a fire. They’d make hot cocoa for us, putting Baileys in their own. We would have something for lunch, usually hot soup in a thermos and sandwiches. We always brought a carrot or two for making snowmen. We would play for hours in the snow ending up so wet and cold. And no matter how wet and cold we got, we were always excited to go again the next time. We would have epic snowball fights. Tacking each other and wrestling in the snow. I miss all of this. I miss just being a carefree kid playing happily in the snow. I want to enjoy that again. I always remember wanting an old truck. I am not really sure why. My dad was never into them, none of our family friends ever had one. But for some reason I have always been drawn to them. I have always thought that they are so cool. When I was about 14 years old I went around with my mom to look at various old trucks some of her customers owned. An old truck that I could rebuild. The customers had thee old trucks that they never really cared for. One in particular could have been really awesome but the body of the truck was sunk about 6 inches deep in mud. I remember feeling so disappointed. I thought we would never find my truck. My truck came as a surprise. Without even telling me my mom had made a deal to get it and then surprised me with it at Christmas. It is a 1955 Chevy Step-Side. Now keep in mind that this truck did not run and was up on wooden blocks because the rubber tires had rotted away. Most people would have looked at it and been disgusted. I was so happy, it was perfect! She had a tow company she knows take it down to the shop where I spent weeks and weeks working on it before I even got it to run. I really enjoyed working on it. The guys at the shop would help me, guide me, and explain what I needed to know. I brought my truck back to life. I felt so proud when I first got it to run. And it was so loud because it had no exhaust. Once it was running my mom had an exhaust shop she knows put an exhaust on it because it was tooooo loud!!! I spent so many hours working on my truck. It’s a really good truck and when I come home I can’t wait to take my Honey Bee out for a ride in it! One of my favorite things about Christmas was always the stockings. They would be put up, handing there for the days or weeks leading up to Christmas. Empty and waiting to be filled. Then Christmas morning they would be so full, packed all the way to the top. But they weren’t full of simple “toys” like the present beneath the tree. The stockings were always filled with special things, thoughtful things, tokens of love. The stockings were personal; they had treasures inside. 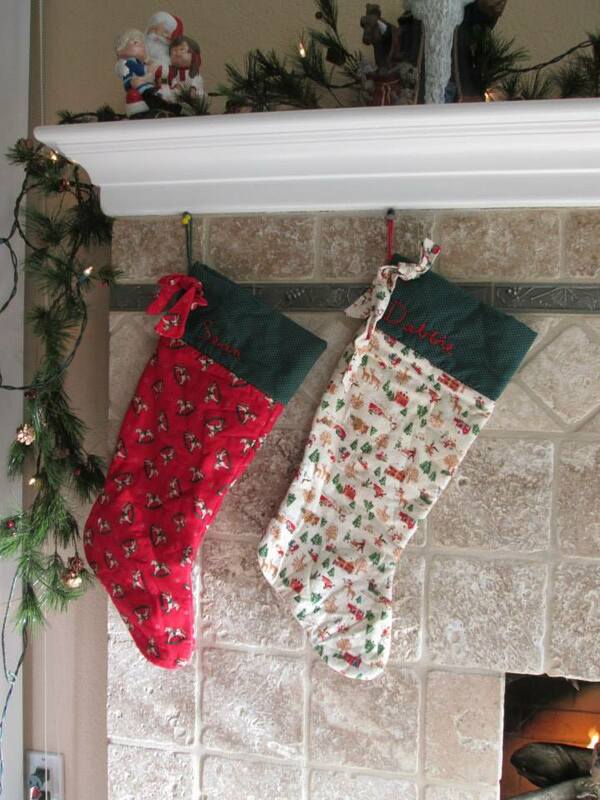 Then were would go to my grandma’s house where she had another stocking prepared for everyone. Aunts, uncles, nephews, nieces, cousins, grandchildren, everyone had a stocking at Grandma’s. I loved to get there early to see them all, she would lean each one against the wall lining the living room, too heavy to even hang. So many stockings! They were mostly filled with simple things; candy canes, walnuts, oranges even. But they always had something special and personal inside too. Then she would give me a brown paper bag to empty my stocking into because she kept the stockings to fill up again the next year. Year after year. I will always miss my Grandma and those stockings at Christmas time. My family’s Christmas was always good. We had traditions that brought our family together during that time. We would decorate around the house and go pick out a real Christmas tree each year, cut it down and bring it home to go in the living room. I remember the smell of the Christmas tree in our home. 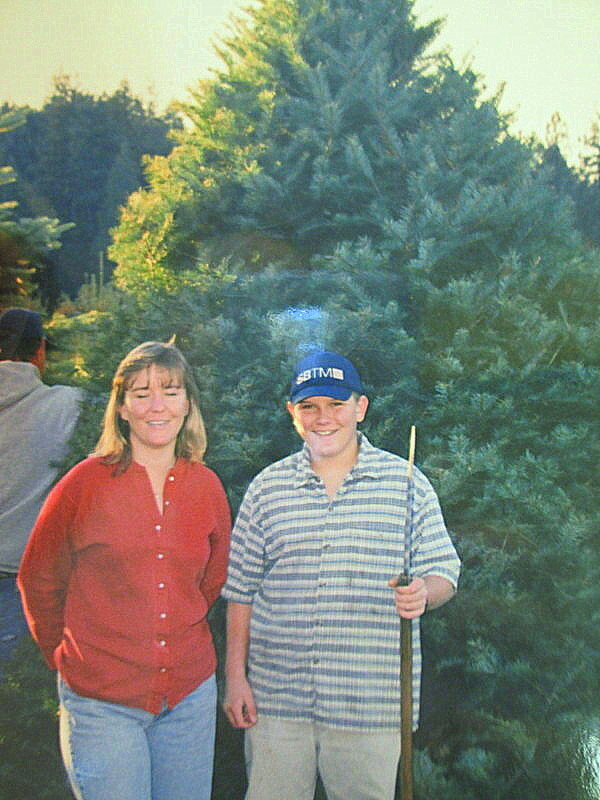 Every year we would go out and select a bushy Douglas Fir to cut down at the nearby tree farms. We would spend the day hunting for our special tree, even after my sister moved out she would still come with us to get our tree. Everyone would help put ornaments and lights on it, a star on top. My mom had made the tree skirt, red on one side green on the other. Before my parents split up my dad and I would hang lights outside on the house. Later at my mom’s Placerville house I hung the lights myself. I always enjoyed that. On Christmas Eve we got to open one present before bed. My older sister was always nicest on Christmas, she loved Christmas and would be so nice. I also remember making sure that every year we got a present for the pup-dogs. They deserved Christmas too! My mom would always make an amazing Christmas Eve or Christmas dinner, it always seemed to change which night she would go all out. I remember one year she cooked a BIG beef roast, I liked that because I got to eat a lot of it and make sandwiches with the leftovers. I also really liked leftover turkey sandwiches. One thing my mom made every year was these green beans with the crunchy onions on top, and these huge fresh homemade rolls. ; like bigger than my fist! They were always so good. My favorite holiday dessert was pumpkin pie but it had to have the whipped cream. A close second was dutch apple pie with some vanilla ice cream on top, Mmmmmm! I miss that a lot. I can’t wait to come home and have Christmas dinner as a family again. That will feel so good and be special to me. When I was 10 or 11 years old I used my 4-H money to buy a go-cart. I would see the go-cart at Williams Power Tools in Shingle Springs on display from Highway 50. I wanted it so badly for so long. And my mom told me that when I earned my 4-H money I could buy it. So I worked hard at 4-H earning the money so I could get it. That go-cart was so cool. We still lived in the Shingle Springs house at that time and it was the perfect place to have a little go-cart. We lived way back in the sticks on these country roads so there was hardly any cars. The road eventually turned to dirt and there were no more houses back there, it ran along a creek and I could zoom up and down that dirt road to my heart’s content. There was a neighbor my age, we used to take turns on my go-cart all day long. It really didn’t go very fast but to us it was so cool. It had a solid roll cage built all around it to keep us safe. None of the neighbors ever complained about us driving it; we were always respectful of passing cars, we wouldn’t ride it too early or after dark. Along that creek, down the dirt road there was a spot where the water was dammed up a little and it formed a “pool” where we could splash around. It was probably about 20 feet across and 4 feet deep at the most. But for young boys on a hot summer day it was a great place to cool off. One of us would drive the go-cart while the other stood on the back, sometimes we had to make a couple trips depending on how many of us there were. I had a lot of fun at that house in Shingle Springs. It was a good area with friendly neighbors. I used to have my big ol’ Bearded Dragon lizard, and he just happily roamed around the house. He was a free range lizard just cruising around. He was buddies with both Lindsy and Pete dog. When he first began roaming freely Pete dog wanted to play and Mr. Dragon lizard puffed up his beard and opened his mouth all wide. Pete settled down and they were buddies after that. Sometimes Mr. Dragon lizard would crawl across the floor with Pete dog following curiously behind. Lindsy would lift her head up from where she was laying, look at them, then put her head back down as if she couldn’t be bothered with their silly games. My favorite memory of my Bearded Dragon is with my niece, Maddie, who at this time was still just a teeny little girl. The lizard didn’t actually have a name and Maddie just called him Dragon. At first she acted so afraid of him and wouldn’t go anywhere near him. Over time she would go closer to the lizard acting like she was going to touch him, then squeal, giggle and run away. She tried to tell us he bit her a few times but were were watching and he didn’t bite her, he was a tame lizard. Then out of nowhere Maddie began picking him up and carrying him around, his head and front legs would be hanging over her little arm, his body out the back with his tail dragging on the ground. She would march all around the house with Mr. Dragon lizard like that, so happy and proud of herself. I remember when she came over she would immediately look for her dragon, pick him up and carry him around all day! And the lizard went along with this arrangement without a single struggle. It was always so cute. When I had my 4-H Steer my niece, Maddie, was between 2 and 3 years old. 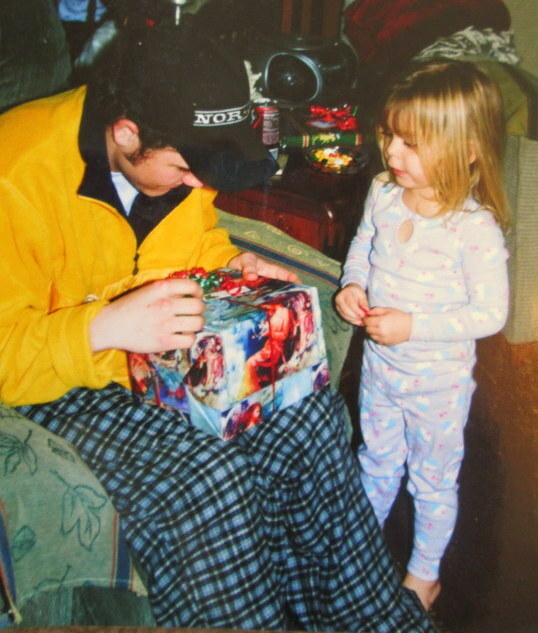 Maddie loved Chester Steer, every time she came over she would get so excited “Uncle Sean! Go see cow!….COW!” She would put her little arms up in the air, her hands opened wide for me to pick her up and carry her down the hill to go see him. When we got close to the railing, her hands would grab my shirt so tightly. “Look, cow! !” she would say. I would ask her if she wanted to pet him and she would say “Noooooo!” and shake her head. Then I would show her it was okay, he was a nice cow and then she would pet him too. Later she never hesitated to pet him. She loved the steer and when he would lick her hand she would giggle and giggle as if it were the funniest thing in the world. Then should would want to see the chickens or the pigs, but we always ended up back at “COW!” Finally we would go back up the hill and about half the time she would say “Uncle Sean, cow again?” With big eyes all bright and pleading. Sometimes I would take her down to see the animals two or three times. These are some of my favorite memories of Maddie; carrying her down to see the animals, how excited she got to see them. She really loved animals then. I don’t know if she still does but when she was little she absolutely loved animals. Which I loved because I love animals too. When I was little we had this tree in our front yard. This tree wasn’t very big, but it was sturdy. It the was the right size to pull myself up into it. The tree was too small to “climb” but I could sit in it and move around on it’s branches. When it was thick with leaves I was always convinced I wouldn’t be seen in the tree. It was my little spot. I enjoyed that tree. I always liked climbing trees, I felt free climbing a tree. My grandma’s house had several good climbing trees and this one in particular I remember my cousin Rachel and I climbing all the time. I always liked climbing the great big pine trees at Sly Park, they were easy to climb and I could climb up so high in them. I would climb up and no one would even know I was up there. My buddy, Scotty Woodward, and I did this all the time. We would go up a tree when no one saw us, scurrying right up it. I liked seeing the world from high up in a tree. Trees are good. The last fishing adventure I went with my dad on was a good one. It was just the two of us, I don’t remember why we got to go by ourselves but we did. We went down to Nimbus Dam at Lake Natoma. We went fishing below the dam where all the salmon fisherman go, but they weren’t there because the salmon weren’t running at the time. My dad and I got all set up with our fishing lines cast out into the water. It was quiet and peaceful towards the end of the day. The weather was cool but not cold. We caught several average size rainbow trout, all about 1 pound, we let them go back into the water. What we really wanted was a steel head. We didn’t expect to catch one that day but we sure wanted to. Suddenly there was a small bite on my rod, just a nibble. I watched closely for more. Another nibble, then more. There was definitely a fish on my line. Slowly, I picked up my pole and got ready. I tested the line with my finger for pressure, I felt him bite so I went and set the hook, just lightly because I was expecting another small trout. As I set the hook another fish pulled back. By reel began whining as the line was taken out. This was no small trout. This fish is a hog!! I fought that fish for a good 45 minutes, bringing him in only to have him take more line back out. I followed him up and down the bank, staying calm and patient as I fought the monster fish. My dad watched me. I know my dad wanted this big fish. Finally the fish came in, he is tired and done fighting. There he is, I have him. And he turned out to be a 12 pound steel head. He was a beast. I was so proud of my fish. I know my dad was proud of me too. We took him home and took pictures in the driveway. That was the last time I remember fishing with my dad. And the only steel head I ever caught. There was this spot at Sly Park where the creek came down the hill and into the lake. It was a creek big enough for fish to swim up. When I was about 12 I was playing around the creek, hiking along beside it, searching and looking for critters. I came to a section that was about four feet wide and only about 18 inches deep, and there was four or five trout in it!! I was so surprised to see them. The water was low enough coming and leaving the “pool” so I decided I wanted to catch them…with my bare hands. Like a real Bear! Off came my shoes, into the water I went, chase, chase, splashing all the way!! It was great fun. And I even managed to catch two of the trout by hand. Yep, I sure did. I would chase them into a spot they couldn’t get away and then grab them with my bear paws. I carried those two hand caught trout so proudly back. Look what I did! Did you know there are several ways to catch crawdads? Yep. You can catch them in a trap of by hand or with bait on a string. This memory is about catching them on a string. We were camping at this place called Twin Lakes. We were camped at the upper lake which had horrible fishing and no crawdads but the lower lake had great fishing and so so many crawdads. With out crawdad traps we caught more than an ice chest full. We gave so many away to camping neighbors. So every time we would go down to the lower lake to fish we would take the boat over there. They had a real nice boat launch that went way out into the water. We would stand up there watching down below and in the clear water I noticed that there were lots of HUGE crawdads crawling around, like the size of small lobsters. We had some chicken we were eating on the bone and I tossed the bone into the water when I was done, the crawdads went for it. So I ate another piece but left a little bit of meat on the bone and tied it to s string and tossed it in the water. Right away I had a crawdad on there, I slowly puled him through the water and he held on. Then when I began to pull him out of the water he let go. So I tried again. I leaned that is you pulled them up too fast or too slow they would just let go. You have to pull them up just right and even then it was still hard to get them all the way up. So we got a net with a pole on it about eight feet long. We started getting almost every crawdad! Keep in mind that no matter how many we caught with our string and chicken it could never compare to the hundreds we caught in the traps. We could maybe catch 10 or 12 as the boat was being loaded while the traps were completely full. But catching them with a string and chicken bone was so much more fun and eating them was delicious. One time at the Thompson’s Auto and Truck Center yearly camp-out I went exploring. I always went exploring there but this time it took me across the dam and down the spill way. I didn’t know what was down there and I wanted to find out. I made my way through the brush alongside the spill way. Later I found and animal trail and an access road. I made my way down to the bottom where the spill way turned up, kind of like a jump to slow the momentum of the water and below that was a pile of giant rocks to keep all the rushing water from eroding away the soil. But then there was this great big crystal clear pool of water. The water had still moved a lot of earth over the years, making an awesome pool of water. This was such a magical find for me, the water was so clear I could see all the way to the bottom, at least 20 feet. There were several trout living in the pool. There were plenty of big rocks to climb on around the pool, easy to jump off into the water and swim. Over the years I went back there several times. It was so beautiful and peaceful down there. The spill way and access road were the only signs of people down there I ever saw. It was undisturbed. It’s a place I would like to go back to one day, I wonder if it is still the same? Did you know there is a huge waterfall at Sly Park? It’s man made and part of how Sly Park gets filled up. There is a canal system that brings the water through the mountain from somewhere else. Where it comes out of the mountain is like sixty feet up and it cascades down into this pool. It is really amazing to see, both when the water is flowing and you can see the “waterfall” and just seeing the pool. It is crystal clear and fun to swim in. There are trails all around Sly Park. When we would camp at Chimney, as we got older, we would go out and explore these trails; sometimes on our bikes, sometimes on foot. The trail cuts across the river at the bridge but then there’s a smaller trail that keeps going. One day we wanted to see what was up there. Plus I believe we were looking for crawdads under the rocks in the “river”. In winter it was a river but in summer is was just a creek at best. So we kept going up it, and we discovered this great big pool of water. So clear and blue and deep. We swam in it and had a good time. I remember looking up, seeing concrete and a hole in the mountain side. We went along the side and climbed out way up there. I remember the earth was soft and lose, I had to grab onto trees to pull myself up. Up top we found a concrete tunnel into the side of the hill. Even though it was completely dry we were too afraid to climb down in it. We KNEW water came through there so we just looked over the side. I remember looking down into the pool below before climbing down, I could see all the way to the bottom and several fish swimming. I went back to that pool many times but only twice did I see the waterfall. So much water, so powerful. And it turns the creek into a raging rushing river. It is such a beautiful park of Sly Park that I doubt very many people even know exist. 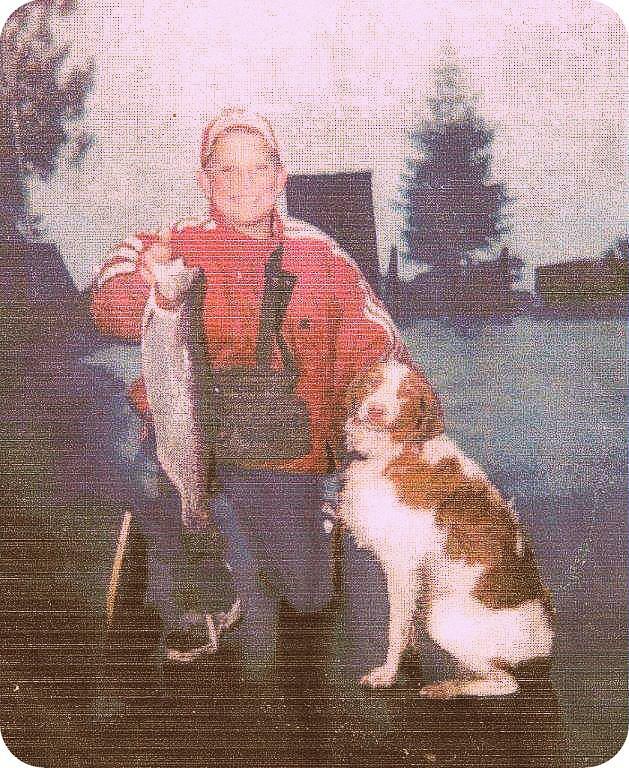 This entry was posted in wrongful conviction and tagged childhood, Christmas, family, fishing, JWLOP, memories, nature, pets. Bookmark the permalink.